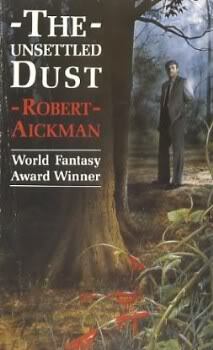 Today is Robert Aickman's 98th birthday, and in honor of that, here are some thoughts on my favorite Aickman story, "The Stains". 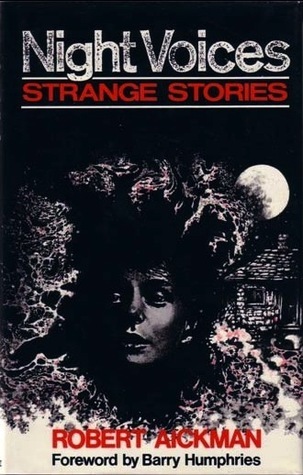 I've been meaning to write about Aickman's work, and this story in particular, for a long time, but I have found it difficult to muster the courage to write about works that are so mysterious, so ineffable, so richly strange and deeply affecting. I think it is no coincidence that I have had the same struggle with the work of Franz Kafka, who is absolutely central to my reading life, and yet I have never written at much length about him at all. Aickman is not as great a writer as Kafka, but that's no insult; Aickman's talent and vision were narrower, his oeuvre less ragged. Nonetheless, there is an affinity of effect (and affect), partly, I suspect, because both writers were masters of writing from repressed obsessions, and both found unique, personal forms of fiction with which to encase those obsessions. It is the story of a civil servant named Stephen, whose wife, Elizabeth, has recently died, and whose very straight-laced, controlled world has begun to come apart. Stephen seems like a perfect representation of the stereotypical stiff-upper-lip, aging British male — but really there's nothing essentially British about this stereotype, for it is more generally a kind of masculine ideal: fastidious, emotionally repressed, with a sense that one's status as a (white, middle-to-upper-class) male should lead then to dominance over a world that always threatens chaos. Such attributes lead to a psychology that fiercely guards against the exotic. Stephen's Britishness (and Aickman's) will be important to the story, though, because of the story's subtle allusions to the Empire. Marriage is, for Stephen and his ilk, a vital component in the fight against chaos, and Elizabeth was for him the nearly-perfect wife. ("They said he was a man made for marriage and all it meant. ... [H]ow many women would want to marry Stephen now? A number, perhaps; but not a number that he would want to marry. Not after Elizabeth.") A man made for marriage and all it meant. Elizabeth's only flaw was her inability to bear Stephen a child, preferably a son to carry on his name, lineage, tradition. But no man can have everything, and each needs some burden to bear. It is no surprise that once Elizabeth is dead, Stephen's world shifts toward chaos. Their doctor immediately leaves, and he is replaced not by another man of the same mold, but rather someone different. "The new man was half-Sudanese, and Stephen found him difficult to communicate with, at least upon a first encounter, at least on immediate topics." Stephen leaves to see his brother: the Reverend Harewood Hooper BD, MA. ("Their father and grandfather had been in orders too, and had been incumbents of that same small church in that same small parish for thirty-nine years and forty-two years respectively.") 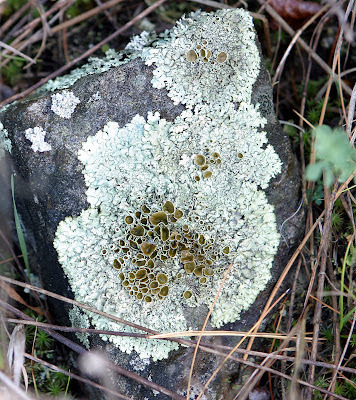 A man of scholarship and God, Harewood is also a "modestly famous" expert on lichens. Harewood's life, too, has been disturbed by chaos from without: "Unfortunately, Harewood's own son, his one child, had dropped out, and was now believed to have disappeared into Nepal." The young male has been corrupted and erased by a world beyond the controlled borders of narrow tradition, and so the entire male future of this family has now been, in Stephen and Harewood's eyes, destroyed. Harewood deals with this by returning to the land and soil, ignoring the wider world that not only devoured his progeny, but threatens to corrupt his faith: "Harewood himself cared more for rock growths than for controversies about South Africa or for other such fashionable church preoccupations." Harewood is married, and Stephen finds his wife, Harriet, discomforting: "She had always seemed to him a restless woman: jumpy and puzzling; the very reverse of all that had seemed best about Elizabeth." She seems like a threat, for she is unpredictable, iconoclastic, free — and, most terrifyingly, somehow attractive and sexual: "he always found that Harriet seemed to be baiting and fussing him, not least when her husband was present; even, unforgiveably, when Elizabeth, down in London, had been battling through her last dreadful years." (The word seemed is very important there: all of this information is related to us through the filter of Stephen's personality.) Harriet represents to Stephen a kind of liberated woman, or liberated mind, someone who can be spontaneous, someone who doesn't recognize the horrible threat posed by the world beyond her own (later in the story we'll learn that "Harriet loved all things oriental" and that she has a "bleak table" that was "a gift from the nearest branch of the Free India League"). All of this has been established in the first ten paragraphs of the story. And it is not a particularly short story — it runs to 55 pages in my copy of New Terrors. With the premises laid out, Aickman then proceeds to systematically add bits of chaos to Stephen's world, to infiltrate its borders, and to create strangeness and terror by releasing the repressed. 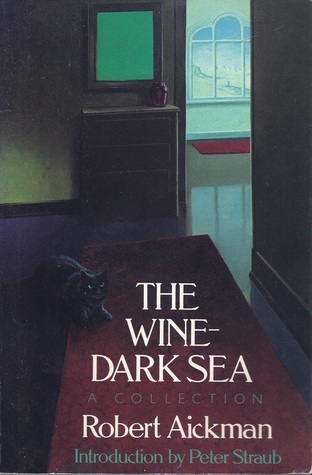 Aickman's mastery can be seen in the way that each detail is given meaning and elaboration, sometimes overtly (even obviously) and sometimes through ambiguity and suggestion — some details feel plainly allegorical, while others gain meaning not through any clear symbolism, but through the insistence of repetition. This is Aickman's particular legerdemain: he usually includes one or two fairly obvious symbolic items, and then surrounds them with details whose meaning is unresolveable, but whose resonance is haunting. grow in the leftover spots of the natural world that are too harsh or limited for most other organisms. They are pioneers on bare rock, desert sand, cleared soil, dead wood, animal bones, rusty metal, and living bark. Able to shut down metabolically during periods of unfavorable conditions, they can survive extremes of heat, cold, and drought. This is the world Stephen comes to inhabit — indeed, to colonize. With the British Empire now diminished, what is left for a civil servant and OBE to pioneer and civilize? (The mentions of Nepal and South Africa were not random: both countries fought wars with the British in the 19th century; Nepal was never a British colony [though the Rana aristocracy was friendly toward the British], and South Africa gained independence in 1931 after just under 30 years of British control of various sorts.) What is left are the leftover spots of the natural world. Too harsh or limited for most other organisms. In that world, Stephen meets a native, a girl named Nell. She fascinates him, and he is irresistably attracted to her. She becomes a kind of path toward liberation for him. She represents a mysterious, ancient world, and that is a significant part of her fascination for Stephen: she is a kind of relic from the past that he so romanticizes. In his mind, she becomes not only a representative of the Old World, but of the natural world. From early in the story, we have seen Stephen's contempt for modern technology, technology which seems to be not only equalizing access to the world, but destroying the hegemonic power of such men as himself, adding chaos to the world. Nell is the opposite of all that. But more than being a representative of the old and natural orders, she seems to be the perfect woman for him, a woman he can gently dominate, teach her, and play the patriarch to. Her passivity is part of her attraction. Stephen is not a man who can feel love for an equal. Unfortunately for him, she has a father. She says he can read minds, including her mind, and she says of him at least twice: "He's frightening." Additionally, she has a sister, a creature very different from herself, and says that if her father finds out about Stephen, he'll lock Nell in the house and send out the sister instead, and Stephen won't like her. They hide from Nell's father in a house of their own, a long-abandoned house they have come upon. It is there that their romance blossoms. There were of course only the bed and the mattress; no sheets or blankets; no Spanish or Kashmiri rugs; no entangling silkiness, no singing save that of the moor. Elizabeth had never wished to make love like that. She had liked to turn to the record player, almost always Brahms or Schumann (the Rhenish Symphony was her particular favorite), and to ascend slowly into a deep fully made bed. Her body was as brown as a pale chestnut, but it was a strong and well-made body. Her short hair was wavy rather than curly. Stephen was ravished by the line of it on her strong neck. He was ravished by her relaxed shoulder blade. He was ravished by her perfect waist and thighs. He was ravished by her youth and youthful smell. Now would be the time to mention the stains. Nell is reluctant to turn over for Stephen, but eventually he persuades her. On the skin between her right shoulder and her right breast was a curious, brownish, greyish, bluish, irregular mark or patch, which had been hidden by her shirt, though Stephen could not quite see how. It was more demanding of attention than it might have been, partly because of its position, and partly, where Stephen was concerned, because of something vaguely else. In any case, it would mean that the poor girl could not reposefully wear a low-cut dress, should the need arise. The hidden has now been revealed: a mark, an imperfection. It lurks between the shoulder, which can be revealed without embarrassment in most Western societies, and the breast, so often the most desired hidden part of the woman's body, the common fetish feature as well as the source of nourishment for the youngest children. No wonder Stephen finds it especially attractive ("the effect was to make him love her more deeply; perhaps love her for the first time"). But note what his first instinct is: "it would mean that the poor girl could not reposefully wear a low-cut dress, should the need arise." He assumes she must be embarrassed, even ashamed by the mark, the mark he finds so thrilling, the mark that allows him to "perhaps love her for the first time". Nell's flawed body was celestial. Nell herself was more wonderful than the dream of death. Nell could not possibly exist. Later, Stephen spends some time back at Harewood's house, and there are stains there, too: "As soon as Stephen turned on the hanging light in his bedroom, he noticed the new patch on the wallpaper; if only because it was immediately above his bed." Stains are spreading through Stephen's world. But there Nell really was; really, really was. In his soul, Stephen was astonished. Things do not go like that in real life, least of all in the dreaded demesne of the heart. However, they unloaded the Land-Rover together, as if everything were perfectly real; toiling up the heather paths with heavy loads, Nell always ahead, always as strong as he: which was really rather necessary. 1. First or earliest as recorded by history; present from the beginning; primitive. Of peoples, plants, and animals: inhabiting or existing in a land from earliest times; strictly native, indigenous. 2. Of or belonging to the aboriginals or earliest known inhabitants of a land. The application of the word to people goes back at least to the eighteenth century in English. Its most familiar association for a while now, though, has been with the Aborigines of Australia, an association that once again calls to mind images of the British Empire (and its penal colony). With all these meanings and connotations, there is no one word that more fully represents so much of the thrust and import of this story. Immediately after Stephen perceives his new, aboriginal home, Nell says, "I've run away. Take care of me." The next, single-sentence paragraph: "They entered." So while the equality of strength between them is useful for getting to their new, aboriginal home, once they are actually there, Nell becomes needy, and Stephen can enact the role of the powerful, protecting patriarch. He carries her across the threshold of their house, as if entering the happy ending of his own private fairy tale. He does not want to remain aboriginal, though. The modern world is too appealing, too familiar. He seeks to meld the strength of the aboriginal past with the familiarity of contemporary reality: "Henceforth, an ordinary modern girl was what for him she would firmly be; though loyaller, tenderer, stronger than any other." The stains haunt them, though. The stains are entropy, impurity. For a while, Nell remains a pure, only partially blemished beauty in a world that is rapidly deteriorating. The stains spread — they appear on the walls of his own home (on walls originally painted, he notes, by Elizabeth), and at his office. And then the stains spread to Stephen. "What's that thing on your back?" one of his colleagues ask as they undress to go swimming. Stephen can't see it, so has it described to him: "it looks rather like the sort of thing you occasionally see on trees". A kind of lichen, perhaps. As if his own body is now being colonized. Nell meanwhile is gaining knowledge, though knowledge of a bookish sort. ("She seemed to know so many quite literary words.") Part of Stephen's power has come from his command of knowledge that she does not have. But that power is waning. "By now, it could hardly be clearer that she knew almost everything that mattered in the least." She is not, though, a modern woman quite yet. He had promised to buy her a dress, but then forgot. "I shan't need a dress." "You must want a change sometime." "No. I want nothing to change." He gazed at her. As so often, he had no commensurate words. She denies the press of modernity, of progress. This kills Stephen's language. Communication fails. She will not be assimilated into his civilization. She might as well be a half-Sudanese doctor. Then Stephen has cause to define the word lichen for Nell. 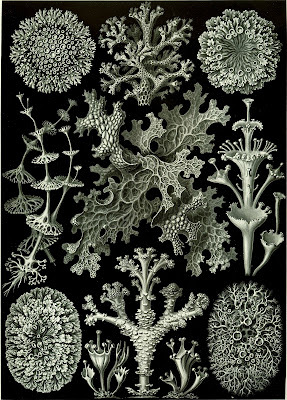 "A fungus and an alga living in a mutually beneficial relationship," he said under his breath. "It's the fundamental description of a lichen. You should know that." Is Nell asking "What's that?" about the full description, as Stephen assumes, or about the idea of "a mutually beneficial relationship"? It's ambiguous. What's not ambiguous is that she doesn't want to talk about it — she doesn't want communication about this concept. When he dashed off his gloves in order to caress her, he regarded only her eyes and her raiment; but later there was eating to be done, and it is difficult, in very primitive lighting, to eat without at moments noticing one's hands. These particular hands seemed at such moments to be decorated with horrid subfusc smears, quite new. Under the circumstances, they might well have come from inside Stephen's driving gloves; warm perhaps, but, like most modern products, of no precise or very wholesome origin. If ineradicable, the marks were appalling; not to be examined for a single second. But then Nell takes off her dress and Stephen discovers that her own stain is gone. What is outside? What force of nature is stalking them? "He divined that outside or inside the little house was Nell's father." Nell believes the same. They cower in the darkness of the house they have appropriated, a house that, Stephen realizes, is made entirely of stone "lined with moss and lichen". He grows claustrophobic: "He was already beginning to feel cramped, and the smell of the fungi and the algae were metaphorically choking him and the moss realistically tickling him..." The metaphoric and realistic conspire to torment him. He summons memories of civilization: of opera and film and Elizabeth. He tells Nell he loves her. "'I love you,' said Nell, snuggling ever closer; manifesting her feeling in every way she could." And then the next sentence: "Curiously enough, it was at the verge of the small, lustrous pool that Stephen's body was ultimately found." Stephen's funeral is at Harewood's church, "where the father and the grandfather of both the deceased and the officiant had shepherded so long with their own quiet distinction. People saw that no other solution had really been thinkable." Tradition has triumphed. Stephen's OBE is placed on the coffin, and Harewood notices a bit of lichen on it that is unlike any around, one for which he can't immediately come up with a name. Then he discovers an expensive book on lichen at Stephen's house, one that Stephen had received from someone who had mistaken him for his brother, and Harewood assumes Stephen bought it himself out of interest. "I never knew he was really interested," Harewood says. "One can make such mistakes." And then, finally, there is Stephen's car, which "was so far gone that it could be sold only for scrap; but, in the event, it never was sold at all, because no one could be bothered to drag it away. If one knows where to look, one can see the bits of it still." The story ends there, with an image of technology conquered by time and nature, a relic or ruin, a possession that stands perhaps as the last physical memory of its possessor, a man who found love and freedom and terror in a death in the old, barren world, a world that destroyed language, a world welcoming only to the imperialist pioneers of bare rock, desert sand, cleared soil, dead wood, animal bones, rusty metal, and living bark. 30 Years After Fassbinder: Where to Begin?